There is a review of the new Tana French book over at Hey Lady! Whatcha Readin'? This blog is new to me courtesy of Google Reader's suggestions (thanks Google!) and it looks like it's right up my alley. Let’s just cut to the chase, shall we? THIS IS THE BEST BOOK I’VE READ THIS YEAR. Truly, seriously, I’m not even kidding, I can’t stop thinking about this book. BTW, in that post, she is also offering a chance to win a copy. Penguin and Sam Taylor, author of The Amnesiac, kindly offered up Taylor's upcoming novel The Island at the End of the World as the foundation of our competition. Designers, illustrators, painters and photographers contributed more than 300 ideas for the cover design of Taylor's new book, and a jury comprised of Penguin editor Alexis Washam, creative director Paul Buckley and Creativity editors selected the 25 finalists presented here. Head on over here to see the 25 finalists and here for the winner. Think about it: you did something. You did…something. Even if you only had five bucks, you put it to good use; it counted, and more importantly, you believed that it counted. You tried to make a difference in the face of depressing amounts of evidence that one person, or a small group of dedicated but non-rich people, can't. We can. You did. You did. Keep it up—the contest continues until the end of the month. Psychotic people who are paranoid do scary things because they are scared. And when you're both psychotic and paranoid, it's like that sweaty midnight moment when you sit bolt upright in your bed from a nightmare that you don't yet know isn't real. But this nightmare went on all through the daylight as well. Here is a link to a review in the San Francisco Chronicle. Saks was only eight, and living an otherwise idyllic childhood in sunny 1960s Miami, when her first symptoms appeared in the form of obsessions and night terrors. But it was not until she reached Oxford University as a Marshall Scholar that her first full-blown episode, complete with voices in her head and terrifying suicidal fantasies, forced her into a psychiatric hospital. Saks would later attend Yale Law School where one night, during her first term, she had a breakdown that left her singing on the roof of the law school library at midnight. She was taken to the emergency room, force-fed antipsychotic medication, and tied hand-and-foot to the cold metal of a hospital bed. She spent the next five months in a psychiatric ward. So began Saks's long war with her own internal demons and the equally powerful forces of stigma. Today she is a chaired professor of law who researches and writes about the rights of the mentally ill. She is married to a wonderful man. I'm kind of surprised, but I don't think I've read anything by Elizabeth Berg before. I really enjoyed this book, though. There is an interview with the author in the back of the edition I read, and in it Berg talks about how her characters in this story are more flawed and less likeable than in her other books. I think that's one of the reasons I liked it. I know—it's all UNP all the time around here. Can I help it we're so awesome? French author Jean-Marie Gustave Le Clézio has been announced as the 2008 Nobel Prize winner in Literature. 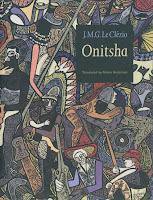 The University of Nebraska Press publishes Onitsha (Nebraska, 1997) and The Round and Other Cold Hard Facts (Nebraska, 2003). This UNP book is on my list to read. 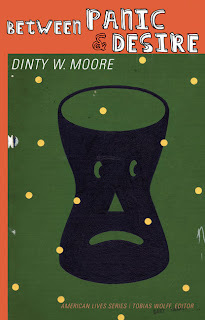 I hadn't read anything by Dinty W. Moore until today when an acrostic piece by Moore was posted over on Sweet Juniper. Go read it—I'll wait. While you are there, check out the photos (I especially recommend the ones of the Detroit Public Schools Book Depository). While you're already clicking around, check out Moore's website and his flickr page. “Insouciant” and “irreverent” are the sort of words that come up in reviews of Dinty W. Moore’s books—and, invariably, “hilarious.” Between Panic and Desire, named after two towns in Pennsylvania, finds Moore at the top of his astutely funny form. A book that could be named after one of its chapters, “A Post-Nixon, Post-panic, Post-modern, Post-mortem,” this collection is an unconventional memoir of one man and his culture, which also happens to be our own. Blending narrative and quizzes, memory and numerology, and imagined interviews and conversations with dead presidents on TV, the book dizzily documents the disorienting experience of growing up in a postmodern world. Here we see how the major events in the author’s early life—the Kennedy assassination, Nixon’s resignation, watching Father Knows Best, and dropping acid atop the World Trade Center, to name a few—shaped the way he sees events both global and personal today. More to the point, we see how these events shaped, and possibly even distorted, today’s world for all of us who spent our formative years in the ’50s, ’60s, and ’70s. A curious meditation on family and bereavement, longing and fear, self-loathing and desire, Between Panic and Desire unfolds in kaleidoscopic forms—a coroner’s report, a TV movie script, a Zen koan—aptly reflecting the emergence of a fractured virtual America. It starts today. Finslippy is in. So is boingboing. We couldn't forget last year's winner, Sars over at Tomato Nation. Keep an eye on the TN blog for updates.